PJ Bernstein has been serving up Jewish deli and diner classics on the Upper East Side of Manhattan for 53 years! From piping hot bowls of soup filled with matzah balls, to home-cooked pastrami sandwiches on rye bread, you are sure to experience a delicious trip back in time to old New York in every bite. The restaurant was established in 1965 by PJ Bernstein, who wanted to offer true home- cooked meals to his guests. In 1986, one of his most loyal customers, Alex Slobodski, bought the restaurant and has been serving up delicious and wholesome meals for over 30 years! You’ll find traditional Jewish eats like chicken soup, challah french toast and borscht along with classic diner favorites. Original highlights include our famous Triple Delight Soup featuring homemade kreplach, matzoh balls and noodles all in one big bowl of chicken soup. At this classic New York City deli, you never know who’ll see. Celebrities such as, Liza Minelli, Joan Rivers, Marisa Tomei, Bette Midler, Simon Cowell and even Lucille Ball and Desi Arnaz have dined at PJ Bernstein. Notable New York politicians Mayor Koch and Chuck Schumer have also visited! PJ Bernstein has been serving up Jewish deli and diner classics on the Upper East Side of Manhattan for 53 years. The restaurant was established in 1965 by PJ Bernstein, who wanted to offer true home- cooked meals to his guests. In 1986, one of his most loyal customers, Alex Slobodski, bought the restaurant. Slobodski had come to America with his family from Russia via Israel and Paris. He drove a cab while learning English and had frequently enjoyed lunch at PJ Bernstein and brought his family in for dinner. He has owned PJ Bernstein for over 30 years! Slobodski has continued the tradition of using only wholesome ingredients at PJ Bernstein to create delicious dishes for his both old and new customers. 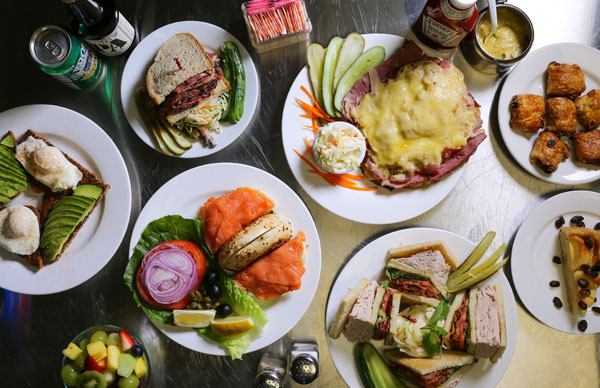 From piping hot bowls of soup filled with matzah balls, to homemade pastrami sandwiches on rye bread, you are sure to experience a delicious trip back in time to old New York in every bite. PJ Bernstein has deep roots in the community. From hosting Club 100 complimentary dinner parties to celebrate customers turning 100 years old, to delivering soup to fire departments on 9/11, PJ Bernstein has deep roots on the Upper East Side. Some of our staff members have even been with us for 10, 20, 30 and even 40 years! You’ll find traditional Jewish eats like chicken soup, challah french toast and borscht along with classic diner favorites. Food to warm your belly and soul!